Membership of the United Nations Security Council is held by the five permanent members and ten elected, non-permanent members. Prior to 1966, there were six elected members, while the permanent members have in essence not changed since the creation of the United Nations in 1945, apart from the representation of China. Elected members hold their place on the Council for a two-year term, and half of these places are contested each year. 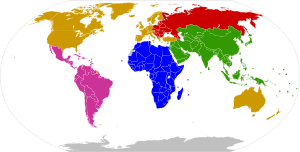 To ensure geographical continuity, a certain number of members is allocated for each of the five UN regional groupings. In addition, one of the non-permanent members of the council is an Arab country, alternately from the African or Asia-Pacific groups. This rule was added to the system in 1967 for it to be applied beginning with 1968. Each year the UN General Assembly elects five new members for a two-year term; these elections always begin in October of the year, and continue until the two-thirds majority for the number of countries for each region has been reached. Re-election is allowed, but the term must not be consecutive. * The representative of Arab nations alternates between these two elected spaces. There were some exceptions to this grouping: Liberia took the place of a Western European country in 1961; the Ivory Coast substituted a member of the Commonwealth in 1964–1965; and the Eastern Europe group included Asian countries from 1956. As part of a proposed expansion of the Security Council, Brazil, Germany, India and Japan, collectively the Group of 4 or G4 nations, are seeking permanent representation on this body. Italy opposed the expansion of the Security Council through the establishment of the group Uniting for Consensus. This list contains the 130 United Nations member states so far elected to the United Nations Security Council, including the five permanent members, all listed by number of years each country has so far spent on the UNSC. Of all the members, 6 have so far ceased to exist, leaving the list with 124 modern nations. These, combined with the 69 modern nations that have never been elected to the UNSC to date (see Non-members, below), make up the entirety of the 193 current members of the UN. 12 Germany 1977 2020 WEOG Includes 4 years when the Federal Republic of Germany consisted only of West Germany (but does not include East Germany's 2 years, listed separately below). 4 Burkina Faso 1984 2009 African For first 7 months of membership of the Security council in 1984 was known as Upper Volta. 2 Yemen 1990 1991 Asia-Pacific (Arabic) The entity elected, and which held the Security Council seat for the first five months of membership, was South Yemen: unification with North Yemen occurred during the time of membership. Serbia as a member of the Eastern European Group has also expressed their wish to apply for United Nations Security Council membership in the future, but did not specify any term. As of July 2011, there are currently 193 members of the United Nations and five permanent members of the Security Council. The other ten seats are assigned amongst the remaining 188 members. As a result, many members have never been on the Security Council. The following list is a summary of all countries, currently 68 modern nations and three historical ones, that have never been a member of the United Nations Security Council. The three historical UN members listed are Tanganyika, Zanzibar, and the Federal Republic of Yugoslavia. Member states of the United Nations that have never been members of the United Nations Security Council as of January 2018[update][needs update]. Saudi Arabia Asia-Pacific Saudi Arabia was elected in the 2013 election, but declined the seat. Timor-Leste Asia-Pacific During the existence of the United Nations, Timor Leste has been a colony of Portugal (until 28 November 1975) and occupied by Indonesia (until 1999); Indonesia was a Security Council member in 1995-6. Zanzibar Commonwealth Seat Was a colony of the United Kingdom from 27 August 1896 to 10 December 1963, then independent until federation with Tanganyika to form Tanzania on 26 April 1964. ^ "Asian group of nations at UN changes its name to Asia-Pacific group", Radio New Zealand International, 2011-08-31. ^ The election was secured by South Yemen, and in May 1990, during its membership of the Security Council, it unified with North Yemen to form the single country of Yemen. ^ Table shows years completed or in progress. Each term on the Council consist of 2 years. Any odd number of years are countries currently serving the first year of a term, countries with terms between 1956 and 1967, when the order of the council changed, or the three countries (Mexico, Egypt and the Netherlands) who had the first terms in 1946 and changed in 1947. ^ Liberia retired after one year following an agreement reached on the 15th Session. Ireland was elected for the remainder of the two-year term. ^ Not a member of any regional group until joining the WEOG in 2000. Crossette, Barbara (3 December 1999). "Membership in Key Group Within U.N. Eludes Israel". The New York Times. Retrieved 17 April 2011. ^ As of May 2006, Kiribati is not a member of any regional group. ^ Montenegro was also part of FR Yugoslavia and of Serbia and Montenegro from 27 April 1992 to 5 June 2006, but these entities were not members of the Security Council. ^ Serbia was also part of FR Yugoslavia and of Serbia and Montenegro from 27 April 1992 to 5 June 2006, but these entities were not members of the Security Council. ^ "Italy, Netherlands ask to share Security Council seat". Al Jazeera. 28 June 2016. Retrieved 1 January 2017. ^ Commonwealth Bureau of Census and Statistics. Official Year Book of the Commonwealth of Australia No. 47 – 1961. Aust. Bureau of Statistics. p. 1143. GGKEY:5SX8QTW3P5T. Retrieved 21 August 2012. ^ "Ghana, Malta pledge to deepen ties". Graphic Online. 27 July 2017. Retrieved 19 August 2018. ^ "Tunisia vows to assert responsibility to represent Africa in bid for non-permanent seat in UNSC". Azania Post. 3 July 2018. Retrieved 19 August 2018. ^ a b "46th ASEAN Foreign Ministers' Meeting Joint Communiqué". VietnamPlus. 1 July 2013. Retrieved 19 October 2013. ^ "Viet Nam makes bilateral leap with Ukraine towards prosperity". Viet Nam News. 17 November 2012. Retrieved 21 August 2013. ^ "Estonian Security Policy". Estonian Embassy in Stockholm. 1 March 2011. Retrieved 21 August 2013. ^ "The candidature of Romania to a non-permanent seat in the United Nations Security Council (UNSC) for a two-year mandate (2020-2021)". Permanent Mission of Romania to the United Nations. Retrieved 19 August 2018. ^ "Department of Foreign Affairs". Irelandunnewyork.org. Archived from the original on 9 March 2012. ^ a b c d "Switzerland's candidature for a non-permanent seat on the United Nations Security Council for the 2023-2024 term" (PDF). Swiss Federal Council. 5 June 2015. Retrieved 1 November 2015. ^ "Trudeau unveils Canada's plan to seek 2021 UN Security Council seat". Canadian Broadcasting Corporation. 16 March 2016. Retrieved 16 March 2016. ^ "Security Council Elections: Options after Saudi Arabia Rejects its Seat". What's in Blue?. 18 October 2013. Retrieved 18 October 2013. ^ Cite error: The named reference India Article was invoked but never defined (see the help page). ^ "Secretary-General, Opening Annual General Debate, Urges World Leaders to Tackle Global Challenges Decisively for Sake of Future Generations". United Nations. 21 September 2011. Retrieved 7 September 2013. ^ "Swiss aim for UN Security Council in 2023–24. – swissinfo". Swissinfo.ch. 12 January 2011. ^ "Speech of the Minister of Foreign Affairs of the Republic of Tajikistan H.E. Mr. Sirodjidin Aslov at the 41st session of the Council of the OIC Member States Foreign Ministers". Ministry of Foreign Affairs of the Republic of Tajikistan. 20 June 2014. Retrieved 1 November 2015. ^ "Dombrovskis and UN secretary general discuss UN priorities and Latvia's interests". The Baltic Course. 16 May 2013. Retrieved 28 September 2013. ^ "Minister Describes Use of Force to Address Problems as 'Ineffective, Meaningless and Destructive', on Fourth Day of General Assembly's Annual Debate". United Nations. 27 September 2013. Retrieved 1 November 2015. ^ "Non-Permanent Member of the Security Council 2027-2028". Permanent Mission of Portugal to the United Nations. Retrieved 1 November 2015. ^ "Seoul to push to win nonpermanent UNSC seat for 2028-29". Yonhap New Agency. 19 February 2014. Retrieved 1 May 2014. ^ "RESOLUTION NO.6/42-ORG ON CANDIDACIES SUBMITTED BY OIC MEMBER STATES FOR POSTS IN INTERNATIONAL ORGANIZATIONS". Organization of Islamic Cooperation. 28 May 2015. Retrieved 23 September 2016. ^ "General Debate Statement by The Hon Julie Bishop MP Minister of Foreign Affairs of Australia" (PDF). United Nations. 29 September 2015. Retrieved 1 November 2015. ^ "Uruguay and Armenia support each other at UN Security Council". News.am. 8 December 2014. Retrieved 28 March 2015. ^ "Countries never elected members of the Security Council". United Nations. Retrieved 13 December 2013.